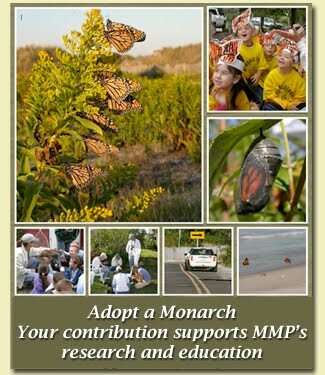 Cape May Monarch Monitoring Project: They're coming! Monarchs gathering at the Triangle Park. The last few days have seen gradual increases of monarch numbers, but this morning seems to be bringing the biggest numbers of monarchs of the year thus far. 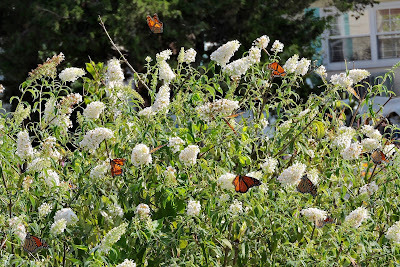 There were 48 monarchs counted on the 9:00 am census and 84 at 12:00 noon. The seaside goldenrod is blooming along the dunes, and many monarchs are being seen here, but there are also plenty of monarchs in the gardens of Cape May Point and flying overhead. We don't know if the numbers will continue to grow this afternoon and over the next few days, but we are certainly enjoying today's show.